Manufacturer & Wholesaler of Agarbatti Packing Machine. Our product range also comprises of CNC Cutting Machine, CNC Welding Machine and Tube Bending Machine. · No. of sticks: 5 to 75 sticks/pouch. ·Diameter of Incense: 2.8 mm to 4 mm. 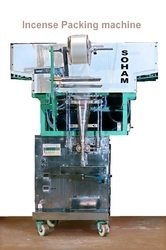 ·Packing Roll width: 80 to 120 mm. ·No. of sticks: 5 to 75 sticks/pouch. ·Film Thickness: 0.02 -0.06 mm. ·Free: Training of machine operation and general maintenance. ·Warranty: 9 months in Main motor, Ac drive, PLC and stepper motor. ·This machine designed by our Engineer. ·This machine is produced by our technical staff. ·Easy to operate & low maintenance.